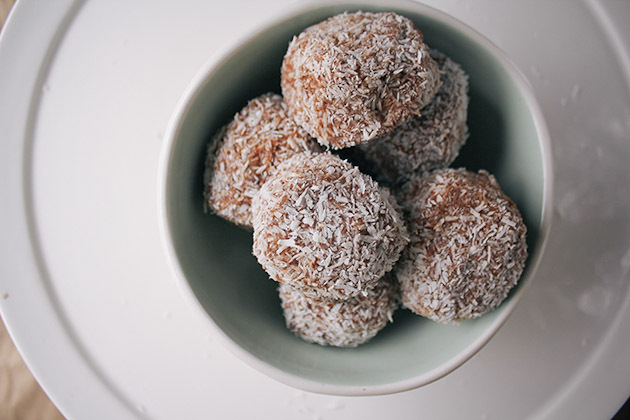 Healthy chocolate bites sweetened with dates and covered in shredded coconut. In a food processor, pulse the dates, pecans, vanilla, salt, cocoa powder, and almond butter. Add water (1/4 cup at a time) until the dough come together and forms a ball. Lay out coconut on a plate and place a piece of wax paper on another plate. 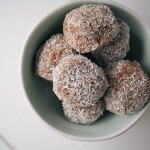 Take a tablespoon (or 2 for bigger balls) of dough with your clean hands and roll it in the coconut. Transfer to wax paper and repeat with the rest of the dough. Stick in the fridge for at least an hour and then enjoy! Keep in a plastic container in the fridge for up to five days.